As the longest-ever government shutdown reached Day 27 Thursday, the number of federal employees working without pay stood at 450,000 -- but that number could top half a million in the coming days, as the Trump administration continues to recall tens of thousands of workers after almost four weeks of shuttered doors at vital agencies. The negative impact on the U.S. economy, which the White House now says will be double its original projections, is already affecting places like Colorado, where craft breweries are awaiting government approval on beers, and businesses such as private contracting firms, some of which are now without work because they were on projects with government agencies. Unlike furloughed federal workers, private contractors aren't guaranteed any back-pay. There are no high-level talks between the president and Congressional leadership planned for Thursday, but during public events, both Trump and House Speaker Nancy Pelosi have traded barbs. The impasse over the president's demand for billions to fund his proposed border wall, which Democrats reject, continues. Here's a look at the effects. 800,000 federal workers are going without pay during the shutdown. Some 450,000 are now required to report to work, and tens of thousands more will be returning after recent announcements from the Trump administration. At the IRS, 36,000 employees were asked to return to deal with tax season, about 1,700 FAA aviation safety inspectors were told to return after the agency ran preliminary safety tests and about 2,500 employees at the Agriculture Department will briefly return to process farm loans. Why don't they strike? Federal employees are prohibited from doing so and can get fired if they don’t show up. What’s more, many federal employees like their jobs and think the work they do is important. But they can call in sick, which appears to be the tactic by many TSA workers. Agency officials there told ABC News they think the sickouts aren’t because of illness or politics, but dealing with financial hardship. Read more related shutdown coverage from ABC News' Anne Flaherty. Speaking at the Pentagon Thursday in a speech that was billed to be about missile defense strategy, the president pushed his border wall and blasted Congressional Democrats. 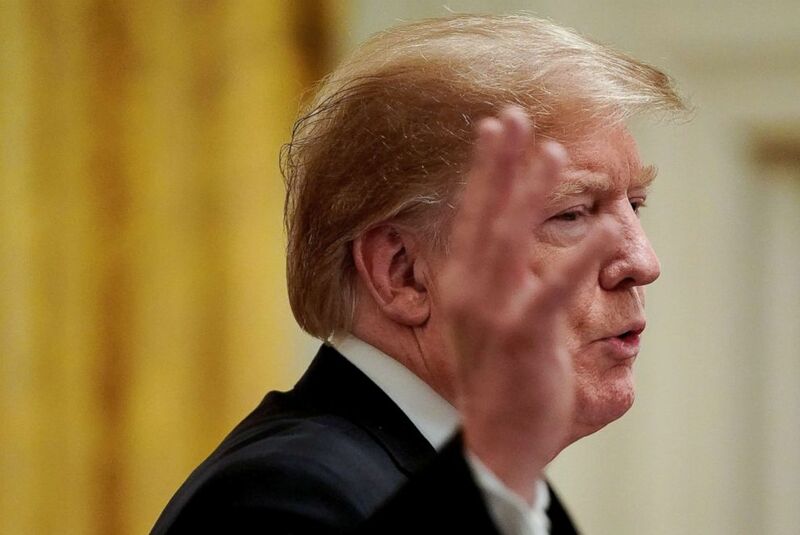 “The federal government remains shut down because Congressional Democrats refuse to approve border security," Trump said. "We're going to have border security." Trump specifically went after Pelosi and accused her of refusing to let Democrats negotiate. “While many Democrats in the House and Senate would like to make a deal, Speaker Pelosi will not let them negotiate. The party has been hijacked by the open borders fringe within the party, the radical left, becoming the radical Democrats,” he said. 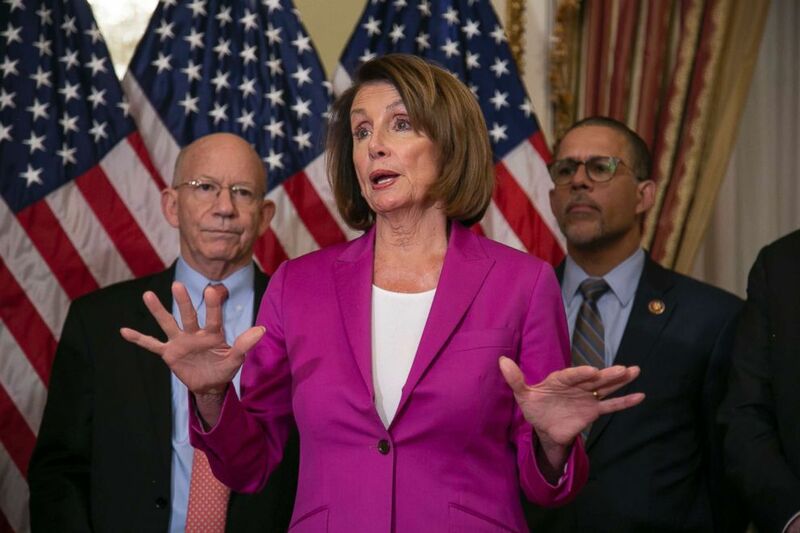 But Democrats have generally remained united behind Pelosi in their refusal to negotiate the president’s border security demands until the government is reopened -- despite permission from Pelosi for her rank-and-file members to have direct discussions with the White House. During a closed-door meeting with Democratic leadership Monday night, Pelosi even jokingly encouraged the encounter, according to an aide in the room. “They can see what we’ve been dealing with. And they’ll want to make a citizen’s arrest,” Pelosi joked, according to the aide. On Tuesday, the president invited a group of rank-and-file Republican and Democrat members to the White House for lunch, but no Democrats attended. Then, Wednesday, a bipartisan coalition of lawmakers from the House Problem Solvers Caucus sat down with the president at the White House. The seven Democrats who attended the meeting released a statement ahead of the meeting that they accepted the president’s invitation in order to relay their message that the government must be reopened as a precondition for further in-earnest conversations. Read more related White House coverage from ABC News' Rachel Scott and Jordyn Phelps. Pelosi says Trump's wall is "imaginary" but her "bills are real"
Pelosi defended throwing a wrench into an invitation to the president to deliver the State of the Union during a press conference on Capitol Hill Thursday, saying the financial factors were real. Asked whether she is trying to deny the president of a platform to make the case for his wall by urging Trump to delay the address until after government is reopened, Pelosi focused on workers who have been denied paychecks. Read more related shutdown coverage from ABC News' John Parkinson. President Donald Trump welcomes the 2018 College Football Playoff National Champion Clemson Tigers in the East Room of the White House, Jan. 14, 2019. On Wednesday, in a closed-press event at the White House, the president signed the "Government Employee Fair Treatment Act of 2019," requiring "the compensation of government employees for wages lost, work performed, or leave used during a lapse in appropriations that begins on or after December 22, 2018." The bill also allows "excepted employees" to use leave during the shutdown. 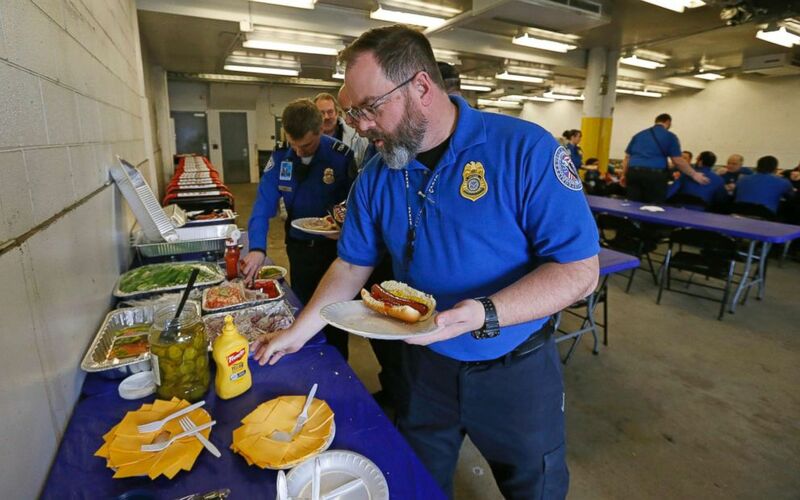 TSA employee Gary Vetterli picks up lunch at Salt Lake City International Airport, Jan. 16, 2019, in Salt Lake City. The government shutdown has generated an outpouring of generosity to federal employees who are working without pay. Read more related White House coverage from ABC News' Jordyn Phelps. The head of the Transportation Security Administration acknowledged to his staff on Wednesday that frontline officers are increasingly calling out of work due to financial hardship caused by the government shutdown, spokesperson Michael Bilello told ABC News. The agency, tasked with securing the nation's aviation system, reported an unscheduled absence rate of 6.1 percent of the workforce for Tuesday, up from 3.7 percent on the same day last year. Call-outs peaked on Sunday at 7.7 percent compared to 3.2 percent the same day last year. Read more from ABC News' Jeffrey Cook.